This pop up card is a fun Halloween craft idea. After attending a great Halloween party, I wanted to send a Halloween card to my friends to thank them. 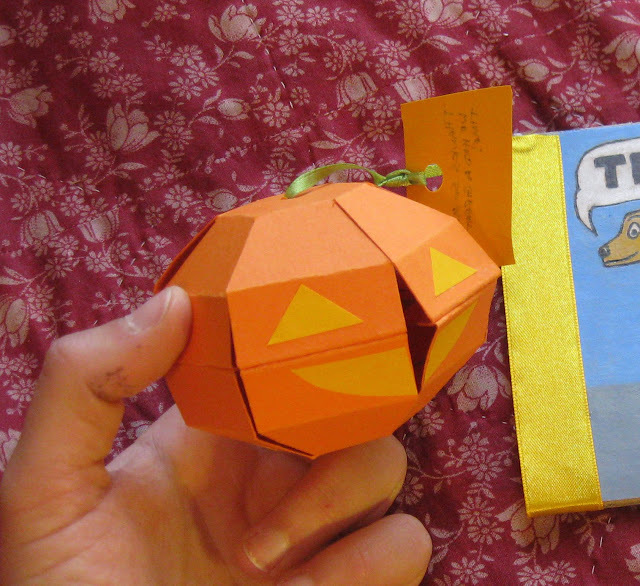 I took a look at various Halloween crafts and felt uninspired, when I realized what I really wanted was a pop up card in the shape of a pumpkin. Researching this Halloween craft project taught me that while there are tons of cool things to make at home that are Halloween-themed, spherical pop up cards are an obscure topic. Below, I share what I found out in order to help anyone else who wants learn how to make this fun Halloween craft. Above is the most promising pumpkin pop up card design I found. It's a rubber band pop up card, containing internal rubber bands tied to the card's inner faces in order to provide tension. These allow it to be smooshed flat and slipped into a stiff envelope, yet still spring back up as soon as you pull it out of the envelope. As far as cool things to make at home and cool Halloween craft projects go, this one is tons of fun to make and receive! A paper cut-out pattern that would fold up into a pumpkin-shaped globe carved to say "Thanks!" The final and winning Halloween craft: a pumpkin shaped 3D pop up card that could be compressed and pop back up (shown above) thanks to rubber bands attached internally. The card can be flattened and inserted into a cardboard sleeve I made (in background, above) before mailing, and pops up into a sphere on its own when pulled out of the sleeve. 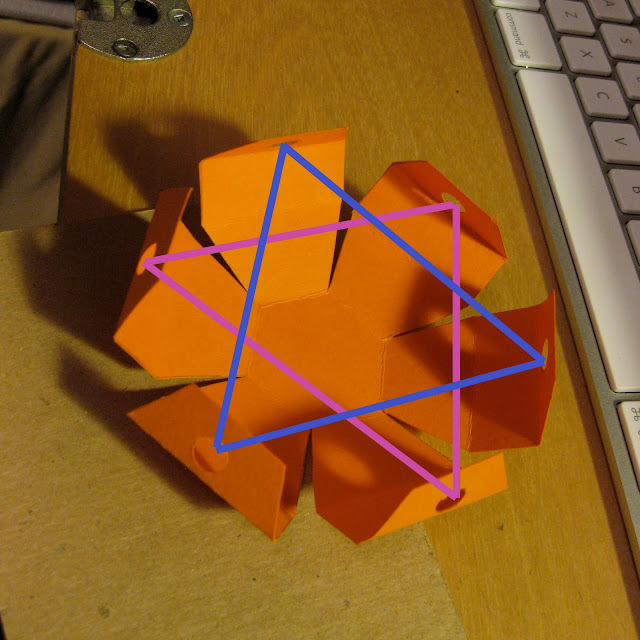 Halloween Craft Idea One was based on dymaxion map and geodesic dome designs. 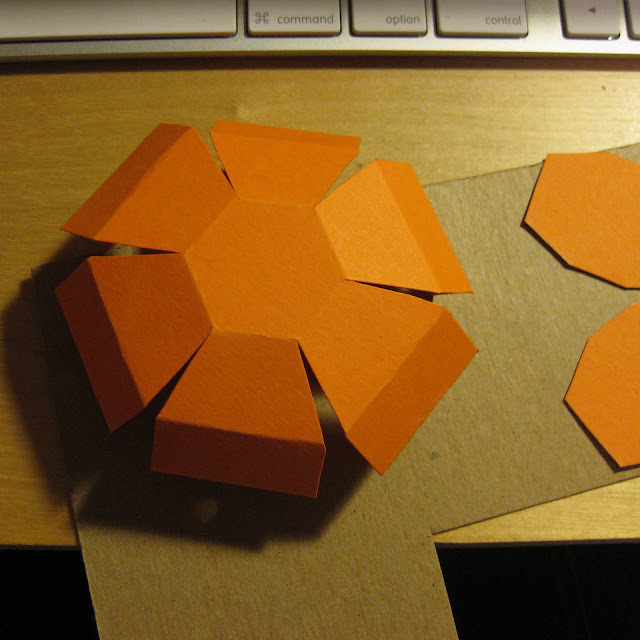 The popup card pattern I used, however, (pictured below) was hard to fold and made a messy looking paper ball. Pattern based on dymaxion map and geodesic dome designs. Halloween Craft Idea Two, pictured below, came from a student's summer research page after a few google searches using terms like paper sphere and sphere pop up card. My prototype version would likely have worked well as a mummy OR a pumpkin, depending on paper color. Two Halloween craft ideas in one! Attempt number two at making a pop up sphere. Finally, I came across Halloween Craft Idea Three when I found a blog about how to make pop up cards that provided a pattern and tutorial for a 3-D pumpkin pop up card. Rubber bands built into the card provide elasticity so that you can press the pumpkin flat, and it will pop back up into its full shape. After some tinkering, I improved on the original design by finding a better rubber band arrangement to thread through the holes in the bottom half of the pattern. Below are a flattened and folded half of the pop up card and a diagram showing my preferred rubber band arrangement. For me, the best design used two rubber bands threaded through alternate tabs of the pattern as illustrated. This balanced the pull of the rubber band equally across the edges of the pop up card. 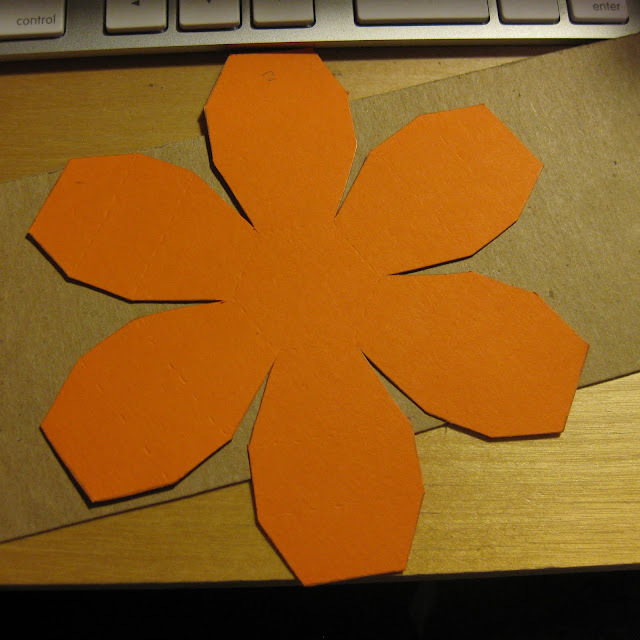 Initial pumpkin card pattern, flat and unfolded. Half of folded pumpkin card without rubber bands attached. Illustration of how to attach the rubber bands for the best results. This was fun for me, as an adult, but would also make a great Halloween craft idea for kids. And, as far as rubber band pop up cards go, this one could make for a very cool squishable Christmas ornament as well if you use seasonal colors.